BlackBerry may be pulling out of making its own hardware (the DTEK50 and DTEK60 are little more than rebadged Alcatels), but one final true BlackBerry is headed our way. Rumored since June, the Mercuryccropped up on GeekBench in October and last month its existence was confirmed by company CEO John Chen. Well, now we have live images. The two photos that just showed up on Weibo reveal a device very much the same as that first shot from June from what appeared to be an internal presentation, so they just may be the real deal. Hidden on that previous image, we now see the prominent front camera and what are likely the proximity and ambient light sensors on the other side of the earpiece - let's just call it a polarizing design. 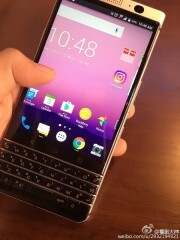 What we know for specs so far includes a 4.5-inch display with a 3:2 ratio (BlackBerry is all about crazy screen aspects - remember the 1:1 Passport?) , a 2.0GHz CPU as part of a Qualcomm chip, 3GB of RAM and 32GB of storage. That front camera we mentioned should be 8MP, while on the back an 18MP shooter is expected. 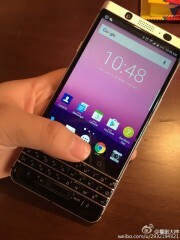 Now, as evident from the images, the Mercury will run Android like every BlackBerry since the Priv, but it just doesn't look like Nougat at first glance, as was previously rumored. It seems we're about to find out for sure any time soon, now that units have started appearing in the wild. We'll keep you posted.